In Tamil Nadu jewellery has been traditionally worn and it is a rare person who will be seen without some ornament. The jewellery making tradition, which dates back to the Sangam era about two millennia ago, had acquired a high degree of excellence and the pieces worn today are similar to the ones worn then. Gold in Tamil Nadu is considered an auspicious metal and good for health. Ornaments are made for every part of the body except the feet, where it is worn only by gods and kings. There is the elaborate thalaisaamaan, worn on the head and hair; this is the traditional bridal jewellery which is set with stones. This was worn by devadaasis/temple dancers who were considered wedded to the deity, and so came to be called temple jewellery. The pieces of the ornaments are shaped like the sun and moon to invoke their blessings, and are set with rubies interspersed with emeralds and uncut diamonds. The pieces are worn on the parting of the hair, along the forehead. Behind the hair decoration is the raakkodi or naagar which is a stone-encrusted piece shaped like a five-headed snake with a swan in the centre. Below this is the jadanaagam or hairpiece that covers or follows the shape of the plaited hair — this set in stones (rubies and diamonds) and has an intertwined design. It starts with stone-set crescent moon and a piece shaped like a thaazhambu or a screwpine flower, after which the longitudinal piece actually starts. Jewellery for the ears is varied; older women in rural areas wear a heavy gold ornament called paambadam made of six earrings which enlarges the holes in the ear lobes. Ear studs can be kadukkan (single-stone), kammal (lotus-shaped with rubies or diamonds), jimikki (bell-shaped ear-drops) and lolaakku ( ear-drops of any design). Maattal is the ornament made of gold or pearls which is hooked to the earring and then attached to the hair above the ear. The other ear ornaments which are not commonly found nowadays are kathribaavali, kuruthubaavali, koppu and jilpaabaavali which are worn on the inner or outer ear or above the ear. Ornaments on the nose are mookkupottu (single stone), besari and muthu (made of eight diamonds), hamsa besari (shaped like a swan), nathu (made of stones) and bullaakku which is worn suspended from the central part of the nose. The others are worn on the right or left nostril according to tradition. The main neck ornament is the thaali the mangalsutra or marriage talisman, which was earlier worn on an auspicious thread and now is worn on a gold chain. The most important part of this is the pendant whose design indicates the community of the wearer; it could be shaped like a thulasi (holy basil plant), the conch and discus of Vishnu or it could be heavily stone-studded as worn by Chettinad women. The other varieties of neckwear are addigai (made of rubies and diamonds), kempaddigai (made of red stones), maangaamaalai (made of stone-studded gold mangoes strung together), pearl necklaces, kaasumaalai (gold-coin necklace), salangai (made of gold beads with black or coral beads), rathna kanti (ruby necklace) and asli haasli as it is known in northern India which is a stiff stone-set necklace which is supposed to protect the collar bone. An upper arm ornament called vanki is usually intertwined in shape and a stone-inlaid piece set in gold; the shape indicates snake or naaga worship. Naagavathu is an ornament for the same part giving the appearance of a coiled serpent and kadayam is an armlet worn by young girls. Bangles or valai for the arms are in plain gold with designs or set with stones. Gettikkaappu is a gold bracelet, thoda is a bracelet with a stone-set crest. 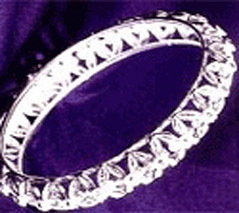 An inverted v-shaped ring called nali to match the vanki is given to a bride by her maternal aunt. Oddiyaanam is a gold or silver belt worn tight around the waist; those with stone-encrusted centres are called asmogappus. Anklets are of various types: ganja golusu (heavy variety with bells that tinkle), thandai (stiff anklets with bells that tinkle) and kaal kaappu (worn mainly by children and believed to protect their ankles). On each second toe is worn the heavy silver metti, the siththu are two rows of heavy silver wires keeping the meti in place and peeli is designed like a crest and worn on the third toe. The concept of R’ta or cosmic order is found in the designs of the ornaments. There is perfect symmetry whereby the left side of a jewel-piece is a mirror image of the right side. Even nose-pins are matched for symmetry (nathu on one side of the nose and besari on the other). The jewellery in Tamil Nadu has close settings with stones deeply embedded in gold. Open-setting work is not done here. Wax is the base on which the design is fashioned in gold and the stones are encrusted, and the effect is heavy and three-dimensional. Tribes in Tamil Nadu like the Todas, Badagas, Kotas of the Nilgiri district have silver and other metal jewellery. The ornaments are huge, heavy and intricately carved. Toda jewel pieces are made of bent wires and shells. The Kadar tribe of Aanamalai hills have bead jewellery; these are bought and sold by Nari Kuravas or gypsies.